That's still an impressive time, even with a potty break. What is more impressive, however, is how smooth you were mile after mile. Little wonder you were passing people left and right at the end of the race. 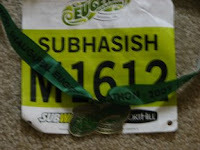 Great job on another nice marathon run and write up. I know you are disappointed with not getting a PR but with all the things that have come up for you in the past few months - you seemed to have run an super rice. Good luck with getting into St. George's. WTG Sub! Considering your injuries and the stop... you have to be pleased with your run. Wow Sub- your photos of the Oregon coast on your return after the race look alot like the ones I took on my way down a couple days before Eugene. Again- great to see you and great race you had. Hope to see you in Seattle this summer.